Listen to episode 30 - hit the play button! 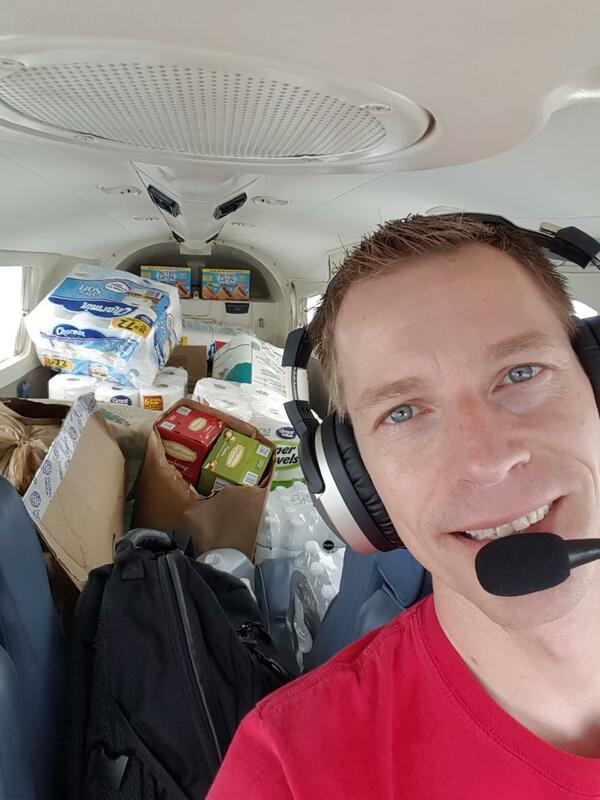 One of our listeners and community members Jeff Poplin volunteered his time and his Piper PA-32 Saratoga to assist in Hurricane Irma relief efforts in South Florida. Thank you so much for your generosity and support, as well as sharing your experience! 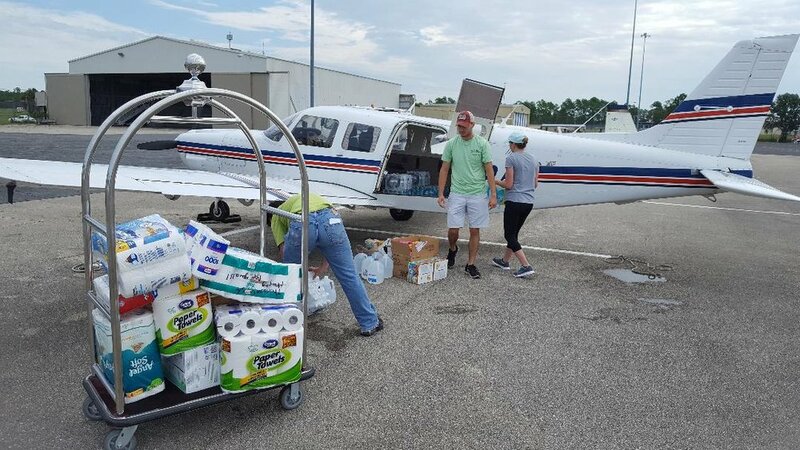 For anyone interested in a twin Cessna, it is highly recommended to join The Twin Cessna Flyers (TTCF - https://www.twincessna.org/) group. twin piston airplanes. Membership is essential to unlock “tribal knowledge” on these Cessna airframes. If you’re looking for an upgrade in speed, range, and comfort from your high-performance piston such as a 210, Bonanza, Cirrus, or Saratoga, both aircraft will fit the bill. The TBM and Meridian may appear on your list of candidate aircraft because, as you might expect, they have a lot of similarities. For example, both aircraft feature a pressurized cabin with room for six, a low-wing design and a single Pratt & Whitney PT-6 engine bolted to the front end. However, the similarities really stop there. As we’re about to find out, each aircraft fits a different mission and is really intended to fill the needs of two different markets. Let’s start with a quick background on each aircraft. First the TBM-700. The 700 was the first of a new generation of single-single turboprop aircraft from Socata. It first flew in 1988 and was introduced to general aviation in 1990. As of the beginning of this year, 822 aircraft have been produced and delivered. While this aircraft has evolved into more sophisticated, higher performance variants such as the TBM-850, 900, 910, and 930 respectively, the later generation aircraft are outside the scope of this discussion. Why? Primarily because of price. A new TBM930 is a $4 million airplane, whereas an early model TBM 700 can be acquired for under $1 million. Now before we dive deep into the performance specs of this airplane, let’s put things into perspective with a brief history lesson. You might be surprised to learn that the TBM-700 is the direct descendent of the Mooney 301, a prototype aircraft built by Mooney in the early 1980s. The Mooney 301 was designed to be a six-seat pressurized single-engine piston-powered airplane capable of flying 260 knots at flight level 250. If you’ve never heard of a Mooney 301 or seen pictures, visit the show notes. You’ll see a lot of similarities in design features between the TBM and this Mooney 301. Unfortunately, the 301 never saw production following financial troubles and Mooney’s eventual acquisition by French owners. The now French-owned Mooney launched a joint venture with French manufacturer Socata called TBM International. To this day, the “M” in TBM stands for Mooney. The team’s objective was to develop a larger turboprop version of the Mooney 301 to be called the TBM-700. Designers and engineers began working on the aircraft with several priorities in mind: speed, performance, and reliability. I would say they got it right—the “700” in TBM-700 stands for the 700 shaft horsepower PT-6 engine bolted to the front end. However, the partnership between Socata and Mooney did not last long. In May of 1991, Mooney withdrew from the program leaving Socata as the primary company involved in the project. Upon entry into service in 1990, the TBM was the first production single-engine turboprop on the market, and still among the fastest turboprop airplanes in the sky. During the first few years of production, the TBM was a big hit among owner-pilots, corporate flight departments, and charter operators alike. However, the aircraft did not have good maintenance or parts support in the United States. Socata recognized their shortcomings and intervened. After listening to customers, Socata decided to invest in building company-owned maintenance support facilities and a network of parts distributors in the United States. As a result, TBM-700 sales increased dramatically. While I’ve also mentioned the subsequent TBM models that followed the 700, there are actually a number of variants and configurations of the 700. The first model was the 700A, which had a gross weight of 6,579 lbs, seating for up to seven, range of about 1,300 nautical miles, and a cruise speed of 290 knots. The aircraft featured a Pratt and Whitney PT6-64 engine, capable of, you guessed it, 700 shaft horsepower. Next came the 700B. The most obvious change to this aircraft was the large cabin entrance door that replaced the smaller entrance door found on many jets. The new entrance door is significantly larger – in fact, it resembles more of a cargo door than a passenger entrance door. Nevertheless, the new addition was a smart one – every subsequent TBM model now has this door. Other improvements made to the 700B include an increase in zero fuel weight and a nicer cabin. Next came the 700C1, which featured minor improvements such as the addition of an unpressurized cargo compartment and new air conditioning system. Then came the 700C2 with an increase in maximum takeoff weight from 6,579 lbs to 7,394 lbs. Finally, the 700N was produced which later became known as the TBM-850 featuring a flat-rated 850 shaft horsepower PT6-66D engine. As far as construction, the TBM is primarily a traditional metal airplane with tail surfaces constructed out of composite honeycomb. The flaps are another interesting talking point. They consume nearly 80% of the wing’s trailing edge. These wide-span fowler flaps help get the aircraft’s stall speed down to an impressive 65 knots. Roll control is still more than adequate despite their small span thanks to the implementation of roll spoilers on the upper surface of each wing. As far as systems and avionics, the earlier TBM feature a Bendix EFIS system. Most aircraft have been upgraded to Garmin GPS navigators such as the 530 and 530 WAAS. The fuel, ice protection, and environmental systems were designed to be simple and mostly autonomous – even the fuel selector automatically switches tanks to keep you balanced. While it’s possible to get into an early-model TMB-700 in the mid $700,000 range, but the average price for these aircraft is still in the $1.6 million range. What do you get for that sort of investment? Well, you get a full-seats range of about 975 nautical miles with useful fuel of about 274 gallons, average block speed of about 280 knots, and fuel consumption of about 50-55 gallons per hour. You can fly up to 31,000 feet with a full-fuel useful load of about 640 pounds. The cabin is ten feet long, four feet wide, and just over four feet tall giving about 143 cubic feet of room. You also have 35 cubic feet of internal baggage space and an additional five feet externally. Not to mention a gorgeous cabin fit for a King – or a queen. And the pressurization system on these aircraft is quite good, giving you a 2,500 foot cabin at 18,000 feet and an 8,000 foot cabin at FL300, with a max delta of 6.2 psi. TBM owners can also join the TBM owner club TBMOPA for great support, documents, and training resources. And speaking of training, like any high-performance airplane, training is a must! In fact most insurance companies will deny coverage unless you’re instrument rated and attend initial and recurrent training on the aircraft from a reputable organization such as Simcom. Obviously the TBM is a lot of airplane for the money. But what about ownership costs? Well 700 shaft horsepower provides a lot of speed, but for a price. I already mentioned fuel burn is around 55 gallon per hour for typical cruise altitudes in the mid-20s at maximum cruise power. Obviously this is an average figure that is subject to change based on outside temperatures and weight. At lower power settings, you can see about 46 gallons per hour. For long-range cruise, you can expect about 240 knots burning only 35 gallons per hour At $5 per gallon, fuel burn will run you between $175 and $275 per hour. Moreover, 700 horsepower doesn’t come cheap in terms of maintenance, either. Depending on inspection programs, the PT6-64 has a TBO of either 3,000 or 3,500 hours, and the cost for an overhaul is about $400,000 which comes out to about $115 per hour in engine reserves. On average you can expect to budget for about $40,000 per year in maintenance, with a total variable cost of about $234,000 per year. If you fly 300 hours a year you can expect to see about $700 per hour in variable costs. Additionally, new paint and interior can run about $50K. Shifting gears to the Meridian, we already covered the Piper Meridian in episode 004, and it’s little brother the Malibu in episode 002. So if you’re interested in a more detailed look at the Meridian, have a listen. But here’s what you need to know: The Piper Meridian is a turboprop variant of Piper’s PA-46 Malibu. Introduced in 1997, the Meridian is a 6-place pressurized high-performance single-engine turboprop equipped with a Pratt PT6-42A engine producing 500 shaft horsepower. Officially designated the PA-46T-500, the aircraft can fly 260 knots for up to 1,000 nautical miles. Like the TBM, the Meridian has undergone a myriad of improvements over the years including subsequent models with upgraded avionics and increases in power. Now let’s compare these aircraft side-by-side to see which one meets your needs. When it comes to choosing an airplane – whether it’s a single-engine piston pusher or a jet, it all comes down to what you need the airplane to do and which airplane can do the job most effectively. For this comparison, we’ll look at an early-model TBM700B and a circa 2000 model Meridian. Both aircraft can be acquired for about $750,000, both aircraft have 6 seats, and both can fly at 30,000 feet for close to five hours. The TBM has a cabin volume of 140 cubic feet where the Meridian comes in at 120. Pressurization in the TBM is also slightly better at 6.0 psi where the Meridian has a 5.5 psi system giving you a slight increase in cabin altitude in the Meridian. Speed clearly goes to the TBM with 200 extra ponies out front for a maximum cruise speed of 292 knots true compared to the Meridian’s 260. However, that speed really does come at a price. The TBO on the TBM’s -64 engine costs about $400K to overhaul, giving us an engine reserve of $115 per hour where the Meridian’s -42A is half that for a reserve rate of about $56 per hour. The TBM has a gross weight of 6,500 pounds compared to the Meridian just shy of 5,000. The TBM wins again in the useful load category – 2,554 pounds with a full fuel payload of 699 pounds. On the other hand, the Meridian’s useful load is 1,490 pounds with a payload of 350 pounds. And speaking of fuel, the TBM has room for 280 gallons compared the Meridian at just 170. Fuel burn for the TBM is 50-55 gallons per hour on average, where the Meridian is right at about 42 gallons per hour. That means the Meridian is about 26% better on fuel for just a 12% loss in speed compared to the TBM. You can expect to spend about $0.97 per nautical mile on the TBM compared to about $0.83 per mile on the Meridian. In car speak, the TBM gets around 5.5 nautical miles per gallon (NMPG) compared to the Meridian at 6.5. However, if you need to get in and out of shorter strips, the TBM has the Meridian beat. According to the book, the TBM only needs 2,034 feet to clear a 50 foot obstacle in normal conditions. The Meridian would need 2,775 feet for the same runway. Landing distance is also marginally better on the TBM. Finally, avionics are different for both aircraft. The current generation of both airplanes come standard with the Garmin G1000 package, but in the earlier-generation aircraft that we’re talking about aren’t as sophisticated. All TBM-700s come standard with a Bendix two-tube EFIS where the earlier Meridians had either a Meggitt EFIS system with Bendix radar, GNS530s and either an STEC 550 or Meggitt 1500 autopilot. Models between 2006 and 2010 were equipped with a fully glass Avidyne Entegra package. Both the TBM and the Meridian can be retrofitted with upgraded avionics such as Garmin’s G600 and GTN650/750s, which also reduces weight and improves useful load. What about ADs? Well, like any production airplane, there are ADs. Both aircraft have a number of ADs that you’re going to want to watch out for including recurring ADs. And by the way, when calculating your annual ownership costs, be sure to include the cost of complying with recurring ADs and scheduled inspections. You can budget that in as part of your hourly costs or simply include it as a fixed expense. Most AD notes that come from the FAA include a ballpark figure for complying with the AD. While it’s not 100% accurate, it does help by giving you a starting point. Finally, remember that all aircraft are to be evaluated on condition – meaning that the overall condition, value, airworthiness, and inspection status of every aircraft is different. You can get a head start of what to watch out for by going to the FAA.gov website and searching for service difficulty reports and special airworthiness information bulletins. These items will give you some idea of what to look for when looking at an airplane. Of course, we can help you navigate through all that stuff as well. So which aircraft should you choose? That really depends on what you need the airplane to do, your list of priorities (i.e. avionics set up, speed, costs, performance, range, and useful load), and the price you’re willing to pay. Yes, you’re going to go a bit faster in the TBM and cover more distance in slightly more comfort, but you can expect to pay up to twice as much for such conveniences. In this instance, each aircraft has its pros and cons. Bottom line is the Meridian is a more efficient and cost-effective airplane for most owner-flown mission profiles. In fact, the Meridian is the least expensive out of all the production single-engine turboprops on the market – and you can get one for less than many newer piston singles. That said, it is up to you to do your homework or enlist the expertise of someone to do it for you so you can be sure you get the airplane that best meets your needs and fits your budget.